The government’s medium-term strategy is to reduce the proportion of domestic (local) debt to 60% by the end of 2019 and increase external (foreign) debt to 40%. On Tuesday, the Nigeria’s President presented the 2018 budget to a joint session of the National Assembly. This administration is full of record breakers. The 2017 budget of 7.44 trillion-naira was described as a record budget. But the 2018 budget estimate is a new national record. 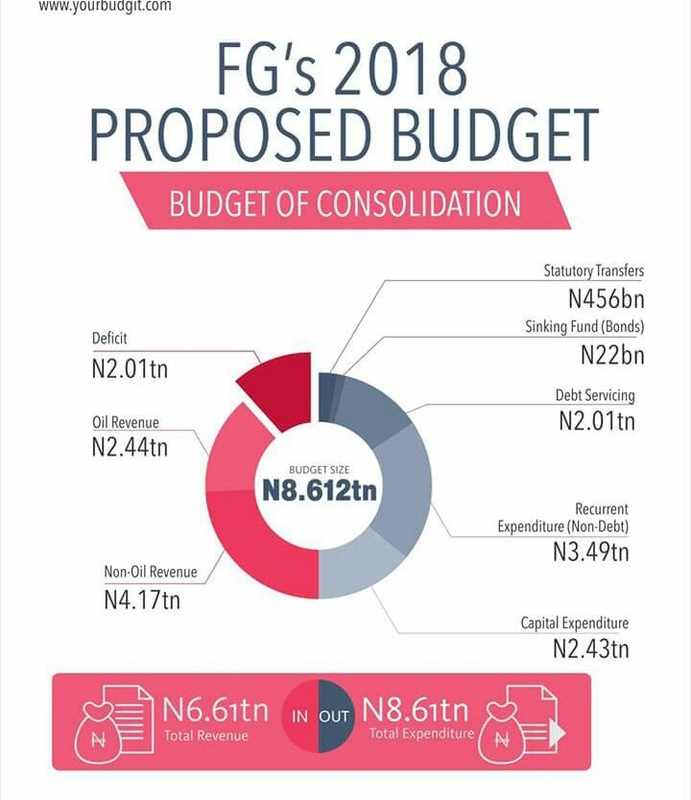 The proposed budget of consolidation is worth 8.612 trillion-naira. This represents a nominal increase of 16% above the 2017 estimates. The President told a joint session of the National Assembly on Tuesday that the budget was based on an exchange rate of 305 naira to the dollar and a projected oil output of 2.3 million barrels per day. Each barrel is pegged at an assumed price of $45. The president said he was targeting January 1, 2018 for the passage of next year’s budget, adding that the deficit is expected to be 2.005 trillion naira and real economic growth is estimated to be 3.5% for 2018. The money proposed to be used to build roads, hospitals, schools, and other infrastructure only increased marginally by 0.01% from the 2017 budget estimates. Where is the consolidation? In the 2017 budget, 30.7% of the budget which amounts to 2.24 trillion-naira was earmarked for capital expenditure. But in the 2018 budget estimates, capital expenditure is 30.08% of the total budget. This amounts to 2.652 trillion naira. As everyone knows, the government does not necessarily have all the cash it needs to fund the budget. It expects that its revenues will not be enough to cover proposed expenditure. To make up for this shortfall, Buhari says the government plans to borrow about 1.699 trillion-naira. 50% of these borrowings will be sourced externally (overseas) whereas the balance will be sourced domestically (at home). “The balance of the deficit of 306 billion naira should be financed from proceeds of privatization of non-oil assets by the Bureau of Public Enterprises, BPE,” said Buhari. Buhari said the government is “closely monitoring our debt service to revenue ratio”. It therefore plans to address this ratio through non-oil revenue generating drive, including restructuring of existing debt portfolio. Presently, domestic debts account for about 79% of the total debt. But he disclosed that the government’s medium-term strategy is to reduce the proportion of domestic (local) debt to 60% by the end of 2019 and increase external (foreign) debt to 40%. A second Niger Bridge across the River Niger has been touted for the past few years. The construction of the bridge has been captured in the 2018 budget with 10 billion-naira allocated. Other major highlights of the capital projects include 9.8 billion-naira for Mambila power project and 35.4 billion-naira for the national housing programme. The social intervention programme is one of the APC ruling party’s cardinal agenda. The idea behind the fund is to cater for the most vulnerable in the society. As controversial as its implementation has been, Buhari said the government has decided to retain it. “This administration is determined to pursue agenda-sensitive, pro-poor and inclusive growth. We are keenly interested in catering for the most vulnerable. “Accordingly, we have retained the 500 billion-naira allocation for the social intervention programme. Under the programme, 100 billion-naira has been set aside for the social housing programme,” stated Buhari. Another of APC’s important programme is the national home-grown school feeding programme which has been implemented across 14 states, feeding about 3 million school children. The government is also continuing to implement the feeding programme in 2018 as well as the coordinated cash transfer programme. 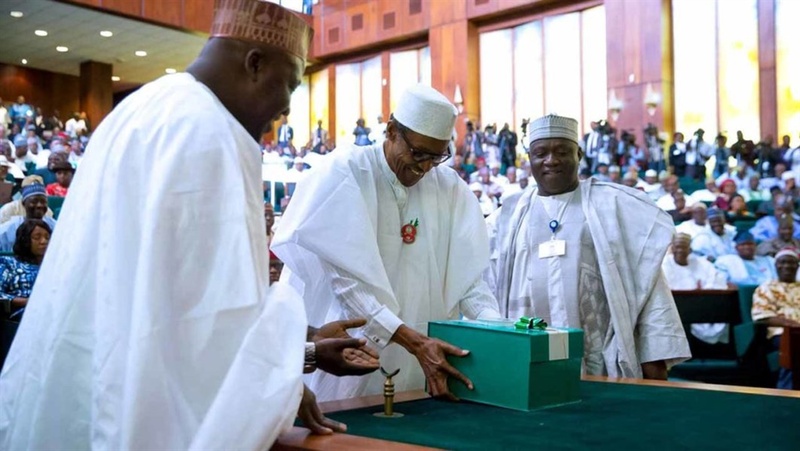 “These initiatives are already creating jobs and economic opportunities for local farmers and cooks, providing funding access to traders and youths as well as supporting small businesses with business education and machine,” said Buhari while presenting the budget. Peace in the oil-producing Niger Delta is crucial for the successful implementation of the budget. As a result, the provision of 65 billion-naira for the presidential amnesty programme has been retained in the 2018 budget. In addition, the capital provision for the Ministry of the Niger Delta has been increased to 57.89 billion-naira from the 34.2 billion-naira provided in 2017. *Agriculture and rural development – 118.98 billion-naira.